On 19 March, Kazakh president Nursultan Nazarbayev announced that he was resigning from the presidency and handing powers to Kassym-Jomart Tokayev, the head of the Senate. Nazarbayev’s sudden move came after a decade of confounding speculation of his imminent departure. Nazarbayev is the last of the Soviet-era leaders, having been chairman of Kazakhstan’s Supreme Soviet since 1989, before the collapse of the USSR and Kazakhstan’s independence. Nazarbayev leaves a mixed legacy. It is by far the best run and wealthiest of the five Central Asian former Soviet Republics and has experienced almost none of the social volatility seen in Uzbekistan, Tajikistan and Kyrgyzstan. It has attracted the vast majority of foreign investment into the region, and Nazarbayev has skilfully balanced the overlapping interests of Russia, China and the West in his country. However, the country is a de facto one-party autocracy with weak institutions and ranks poorly in human rights and media freedom indices, while wealth is concentrated in relatively few hands, with attendant high levels of corruption. Boosted by high oil prices, Nazarbayev steered the Kazakh economy’s rapid expansion in the early 2000s, with GDP growth surging to a record 13.5 percent year-on-year in 2001. This contrasted with the stagnation and socio-economic collapse seen in other former Soviet republics. The rate of economic growth during the pre-crisis year of 2007 stood at a healthy 8.9 percent. Although it plummeted beneath 2 percent in 2009, a quick recovery ensued, allowing the country to grow again by more than 7 percent in both 2010 and 2011. However, a slowdown followed amid a lack of diversification, growing investor impatience with hard-to-hedge risks in emerging markets and uncertainty surrounding the future of Nazarbayev’s regime. The oil crash of 2014 made matters only worse: Kazakh GDP only expanded by a modest 1.3 percent from 2015 to 2016. Growth in excess of 4 percent since 2017 is a profoundly misleading statistic: after accounting for a deep devaluation of Kazakhstan’s currency, the tenge, in 2014 and 2015, Kazakhstan’s GDP per capita in 2017 (in US dollar terms) was only slightly higher than in 2009 and down 35 percent from its peak in 2013. What this really means is that, given its high dependence on unpredictable and uncontrollable oil prices and as the lack of structural reforms has become impossible to ignore, Central Asia’s largest economy has lost a decade of growth. This brings it further away from Nazarbayev’s ambitious goal, which he set in 2012, to see his country become one of the world’s 30 most developed nations by 2050. It is not yet clear to what extent Nazarbayev has actually left the scene. Since a controversial reform of 2010, he has been known as the “Leader of the Nation,” enjoying among other things personal immunity from prosecution even after leaving office (this also applies to family members). He also keeps his position as lifelong chairman of the Security Council, which has been the principal constitutional body since June 2018, and as leader of the ruling Nur Otan Party. Additionally, for good measure, the parliament has voted to rename the capital from Astana to Nursultan – the purpose-built flagship city built in the middle of the steppe was very much his signature project. His successor Tokayev has assumed the presidency for the remainder of the current term (to 2020) in accordance with the constitution, as the head of the Senate takes power upon the president’s resignation or incapacitation. Tokayev has long been a Nazarbayev loyalist: head of the Senate since 2013 (and previously in 2007-11), and prime minister from 1999 to 2002. He has also held the posts of foreign minister and director of Kazakhstan’s United Nations Office in Geneva. However, he has little power base of his own and is not very popular with ordinary Kazakhs. It seems likely that Tokayev will be a stopgap leader in the attempt to ensure a transition to a new leader who is a part of the Nazarbayev family or wider Shaprashty clan. The question that should concern outside stakeholders in Kazakhstan is whether or not the success of this transition is guaranteed. Dariga Nazarbayeva (55), the president’s eldest daughter, has emerged in recent years refreshed and, seemingly, ready for high office. The combative amateur opera singer suffered a sharp political and business decline in 2007 when her husband, Rakhat Aliyev, at the time one of the most independently powerful men in the country, was chased out of Kazakhstan and subsequently died in Vienna in mysterious circumstances. Since her divorce from Aliyev, she has quietly rebuilt her brand and power: in 2016 she was appointed to the Senate as head of the International Affairs, Defence, and Security Committee. Nazarbayeva is, obviously, loyal to her family, but at the same time she lacks widespread popular support or a personal powerbase, meaning she would remain reliant on her father and/or his close advisers. It is unclear how much support she retains among other members of the Kazakh elite: if her father did ordain her – or one of her children – as his successor, this would certainly have greater legitimacy, though might not last long after Nazarbayev’s death. It is notable that, on the day of her father’s resignation, she replaced Tokayev as chairman of the Senate, putting her next in line to the presidency under the constitution. Imangali Tasmagambetov is another mooted candidate. Currently ambassador to Russia, he has held other posts of high importance to Nazarbayev, including mayor of Astana, mayor of Almaty and prime minister. He has built a major business empire through his various lieutenants, including his son-in-law Kenes Rakishev, one of the most prominent rising stars of the Kazakh business scene. However, Tasmagambetov, a charismatic leader, is genuinely popular among Kazakhs, especially in the oil-rich west. This makes it less likely that Nazarbayev would want him to accede to the top job if his intention is to retain the centre of political gravity within his family. Timur Kulibayev, Nazarbayev’s son-in-law (married to his second daughter Dinara), was for many years widely regarded as the strongest contender. At one time immensely powerful in his own right in Kazakhstan, his influence peaked in 2011, by which time he controlled the country’s state energy company KazMunaiGaz as well as Samruk-Kazyna, the USD 74 billion sovereign wealth fund. In recent years, however, his star has waned, not least after Nazarbayev publicly blamed him for an unprecedented outbreak of violence in the western oil town of Zhanaozen at the end of 2011, which resulted in the death of 14 protesters. Following this incident he was removed as head of both KazMunaiGaz and Samruk-Kazyna. However, he is known to have powerful backing from Moscow (he is a board member of Gazprom) and from business circles. Beside these familiar faces, a lesser-known candidate could emerge in early 2020 if not before. Nazarbayev has repeatedly succeeded in misleading his allies and foes alike about his true intentions. In his farewell address, he stressed the need to hand over the reins to the younger generation. Someone like his nephew Samat Abish, currently deputy head of the very powerful National Security Committee (KNB) and directly mentored by Nazarbayev’s most trusted advisor Karim Massimov (former prime minister), could well up-end previous perceptions of the direction that succession should take. Even under Nazarbayev, internal dissent has been rising among some parts of society, particularly those that have benefited less from the high levels of economic growth seen since the late 1990s. Notably this includes the oil-rich western part of Kazakhstan, including Zhanaozen (see above). 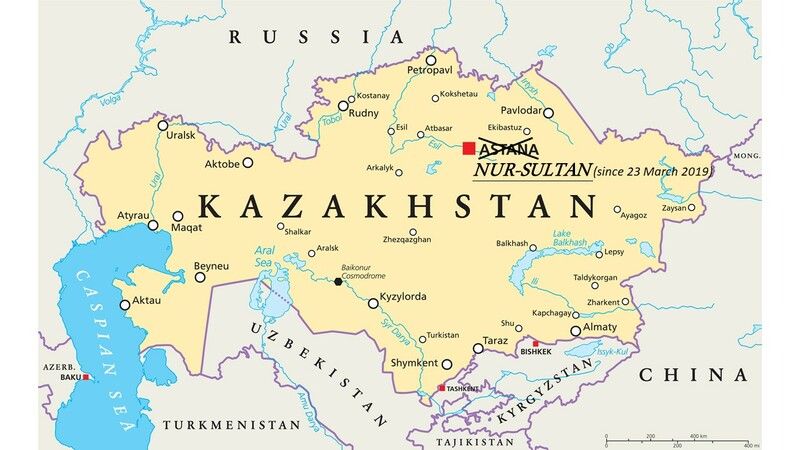 A wave of armed attacks across Kazakhstan between 2010 and 2012, while attributed by the government to previously unknown Islamist extremist groups, was believed by many observers to have its roots in socio-economic discontent, as Islamism’s roots in Kazakhstan are shallow. More recently, protests and demonstrations in cities across Kazakhstan have been unusually intense and persistent, and are believed to have been behind Nazarbayev’s summary dismissal of the entire government in February 2019 (and possibly his own resignation), citing its failure to raise living standards and diversify the economy away from the energy sector. Young mothers aired their anger after a fire in Astana took the lives of five children. Meanwhile, workers were again on strike in Zhanaozen as unemployment remains high and oil sector jobs are dwindling. Since 2014, the tenge has undergone several dramatic devaluations (including 30 percent in one day in August 2015), adding to socio-economic pressures. Since January 2016, the exchange rate has remained volatile. It should furthermore be borne in mind that Kazakhs’ loyalty, or acquiescence, is largely to Nazarbayev personally and not to his family, inner circle or party – and stems from his decades in power. As such, it cannot be taken for granted that a chosen successor, even from among his close relatives, would win the same acceptance. This could be taken advantage of by other interested candidates, adding to instability. Russia, China and the US are all heavily invested in Kazakhstan’s economy and see the country as a bulwark against the more unstable parts of Central Asia. Stability and a smooth transition of power will be their main aims. Nevertheless, they may well try and influence events and back certain potential candidates. Russia has strongly backed Kulibayev, though will now be starting to look at other potential contenders. Observers of Kazakhstan will be watching keenly for which members of the elite come to be championed by Moscow. China, which takes a more pragmatic approach to the region, may seek to exert its influence through business contracts and its considerable economic power (not least the Belt and Road Initiative) rather than by openly manipulating politics. The US has less range and influence than either Russia or China, although president Trump has openly admired Nazarbayev. Compared with the Obama administration, Kazakhstan features less prominently under the current US administration on its regional foreign policy agenda. The balance that Nazarbayev has built between these powers (described as his “multi-vector” foreign policy) risks being tested if his successor, seeking to consolidate his or her power, leans towards one and provokes counter-actions among the others. This carries risks also for investors from countries that a new leader chooses not to favour. A successor will also not automatically have the respect from other important world leaders that Nazarbayev has accumulated over decades: notably, president Putin has always shown respect and consideration to Nazarbayev even while treating other CIS leaders with open contempt. He is less likely to do the same for any successor, and may disregard Kazakh sensitivities and concerns where he previously would have shown tact. Succession in an authoritarian regime represents a moment of maximum danger and Kazakhstan is no exception. The transitions in neighbouring Uzbekistan and Turkmenistan may prove instructive. In both countries, a long-term Soviet-era president died in office and the presidency passed to an insider. In both cases, the successors moved to install their own close associates in key positions, to create their own cults of personality and to launch significantly new policy directions (such as the new Uzbek president’s rapprochement with Tajikistan and Kyrgyzstan after decades of icy relations, and his relative liberalisation of the previously closed economy). This has meant denigrating their predecessor, removing the outward symbols of their reigns and, most crucially, by whatever means, removing key economic assets and positions of economic influence from the close associates of the old regime and putting them into the hands of the new loyalists. Positions of patronage have been replaced: what have previously been useful or even protective government contacts for outside investors have swiftly become useless or even toxic. Outside investors must be aware that the succession is unlikely to be simple as the incoming holder of the presidency, whoever that turns out to be, seeks to assert themselves both against rivals and against an incumbent who has not fully left the scene, and is unlikely to do so in the near future given his apparent good physical and mental health. This will have repercussions across politics, society and business.